Why Not Try the Magic Recipe ? Highly Entertaining Table Magic...When JP performs at a table, people don't easily forget because of the extrodinary things that happen. That means your restaurant or event will be remembered . 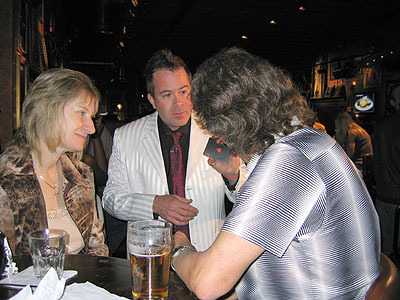 Create a fun, warm atmosphere through the Magic and Mind Reading Skills of JP Quirky Magician. Imagine how Table Magic can brighten up any meal. The magic happens when people are waiting for the their meal to begin or inbetween courses.